Snapchat business model is based on advertising revenues. Even though the company got listed, it didn’t manage yet to turn a profit as of June 2018. In the year ended December 31, 2017, Snapchat recorded revenues of $824.9 million compared to $404.5 million for the year ended December 31, 2016, a 104% year-over-year increase. For the year ended December 31, 2017, and 2016, approximately 94% and 91% of advertising revenues were Snap-sold, respectively, and about 6% and 9% was partner-sold, respectively. Snap Ads, whether Snap-sold or partner-sold, may be subject to revenue sharing arrangements between Snapchat and the content partner. What metrics does Snapchat use to assess its success? ARPU (average revenue per user) because it helps Snapchat understand the rate at which it is monetizing the daily user base. Snapchat defines ARPU as quarterly revenue divided by the average Daily Active Users. Average revenue per user, or ARPU, was $1.53 in the fourth quarter of 2017, compared to $1.05 in the fourth quarter of 2016, an increase of 46% year-over-year. Snapchat defines a Daily Active User as a registered Snapchat user who opens the Snapchat application at least once during a defined 24-hour period. DAU or Daily Active Users, or DAUs, were 187 million in the fourth quarter of 2017, compared to 158 million in the fourth quarter of 2016, an increase of 28.8 million or 18% year-over-year. Revenue was $824.9 million, an increase of 104% year-over-year. Total costs and expenses were $4.3 billion, an increase of 84% year-over-year, excluding stock-based compensation expense and related payroll tax expense. Loss from operations was $3.5 billion. Net loss was $3.4 billion with diluted loss per share of $(2.95). Adjusted EBITDA was $(720.1) million. Cash used in operations was $734.7 million, and Free Cash Flow was $(819.2) million. Capital expenditures were $84.5 million. Cash, cash equivalents, and marketable securities were $2.0 billion as of December 31, 2017. Research and development expenses for the year ended December 31, 2017, increased $1.4 billion compared to the same period in 2016. The increase was due to a $1.1 billion increase in stock-based compensation expense primarily due to the recognition of expense related to RSUs with a performance condition satisfied on the effectiveness of the registration statement for Snapchat IPO in March 2017. 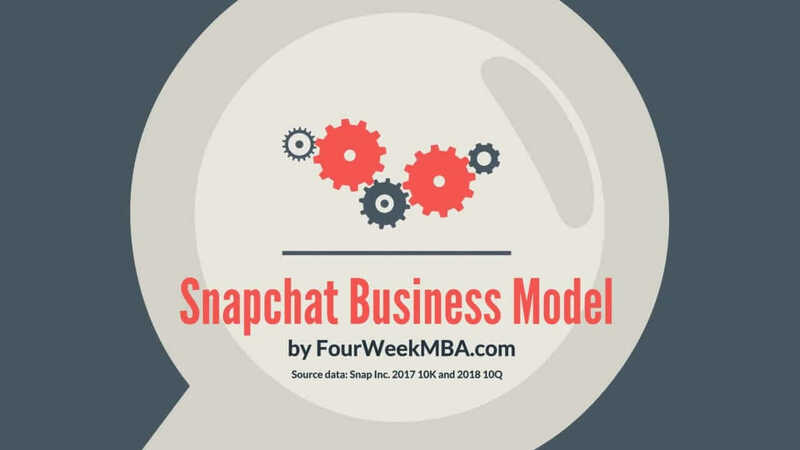 Read Snapchat business model and its startup story.